Botswana's recording artist and former Big Brother Africa housemate Goitse April Kgaswane is in the grand finale of MC Miss Africa 2015 and thus is out to solicit for your precious votes to help her achieve this milestone. Miss Africa" is pageant founded in Oct 2005 as a platform for young African Women to showcase their beauty, talent and culture, serve humanity by giving back to their communities in Africa and make their dreams come true. 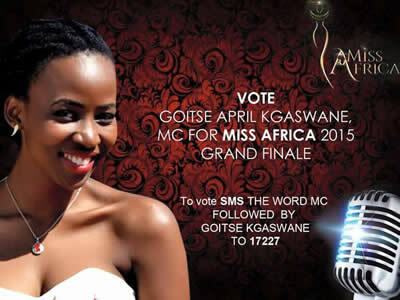 To vote for her SMS the word MC followed by GOITSE KGASWANE to 17227 and show support to one of our very own. See flier above for more details.